Taiwan’s Shilin Night Market inspired pop up is coming to Singapore on 19th – 21st April! Everyone loves Taiwan street food. From their famous chicken cutlet, to stinky tofu, to braised pork rice, these alone can make one salivate just by even thinking about it! Today, we got our hands on the famous Taiwanese Yam and Sweet Potato Ball recipe, shared by none other than Share Food’s founder - Pei Wen! She’s the hands behind 250 over recipes and today she’s presenting her very own creation! Chewy and refreshing, this dessert can either served hot or cold, which is perfect for any season! 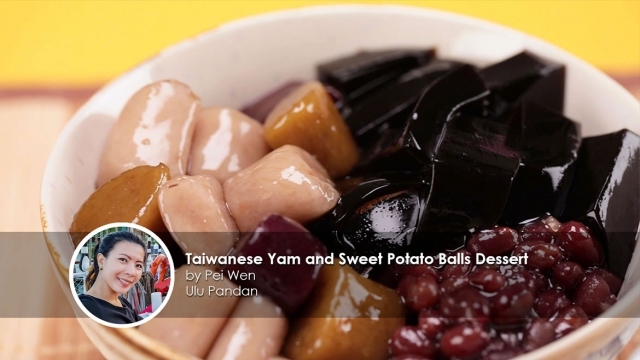 Did you know that yam, also known as taro is a traditional Taiwanese cuisine dessert? It can be found in almost every part of Taiwan, among which, Jiufen's yam ball is said to be the most famous. Chewy and refreshing, this dessert can either served hot or cold, which is perfect for any season! 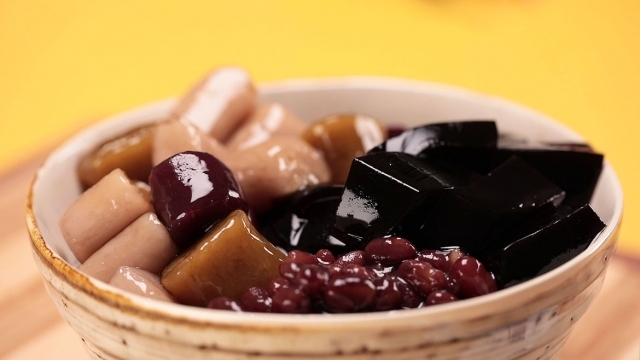 These are the ingredients that you’ll need: yam, sweet potatoes, tapioca starch, white and brown sugar, red bean, grass jelly, coconut milk and ice. Cut them up into long strips to fit into Kenwood kFlex kitchen machine. First, let’s prepare the yam and sweet potatoes first! Cut them up into long strips to fit into Kenwood kFlex kitchen machine. 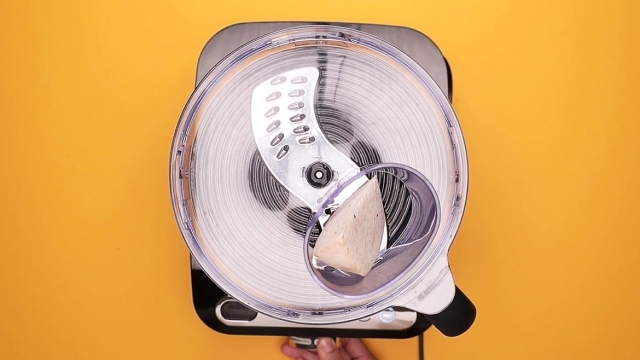 Attach the shredding disk and proceed to shred the ingredients separately. kFlex comes with more than 15 attachments that allows you to blend, chop, shred, weigh, knead, whip and juice, this will definitely save you a lot of time preparing the ingredients! Proceed to steam for 15 minutes until soft. Once the yam and sweet potatoes have softened, transfer them into a mixing bowl separately and pour in tapioca starch and sugar into the respective bowls. Mash them while they are still warm. Proceed to knead them once they have cooled down. Once the dough has reached a smooth and moist consistency, cover it with a damp cloth to retain the moisture in the dough. 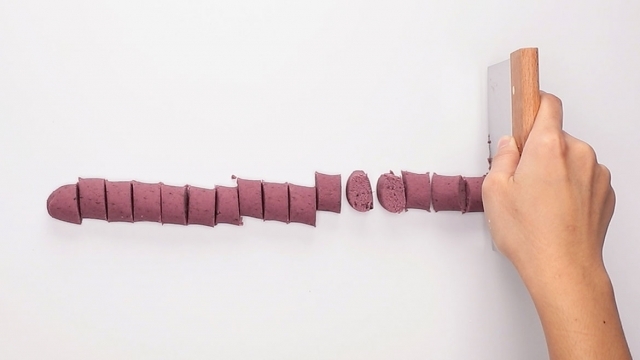 Once all the dough has been rested, roll them into a long strip and cut them to a desired size. Once all the dough has been rested, roll them into a long strip and cut them to a desired size. Coat them with tapioca starch to prevent them from sticking together. A lot of recipes would call for sweet potato flour. However, Peiwen strongly suggest the use of Tapioca starch so that the balls will remain chewy even when it’s served chilled. The tip is not to add in too much tapioca starch as it will dilute the original sweetness from the sweet potato and make the balls too hard to chew on. Adding in light brown sugar will help to separate the balls and add sweetness to them! Proceed to boil 1.5L of water in a pot and add in all the balls. Cover the lid and leave it to boil until all the balls float onto the surface of the water. Proceed to drain and transfer them into a bowl before adding in light brown sugar. This will help to separate the balls and add sweetness to the balls. It’s time to assemble! Using the kFlex, attach the slicing disk and add in ice cubes. Once you’ve gotten a good amount of shaved ice, scoop them into a serving bowl and pour coconut milk over it. 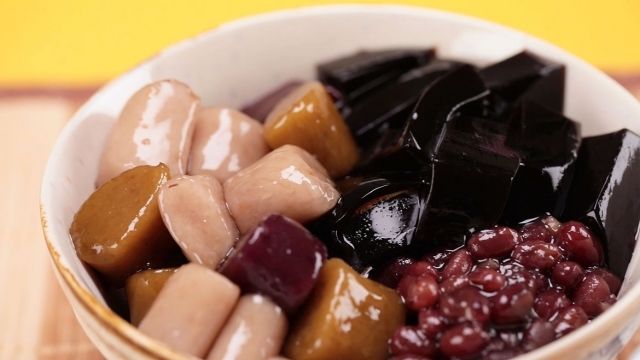 Top it up with some red beans, grass jelly and tapioca balls. A colourful dessert that surprises you with the varying texture in a single bowl. There you go! 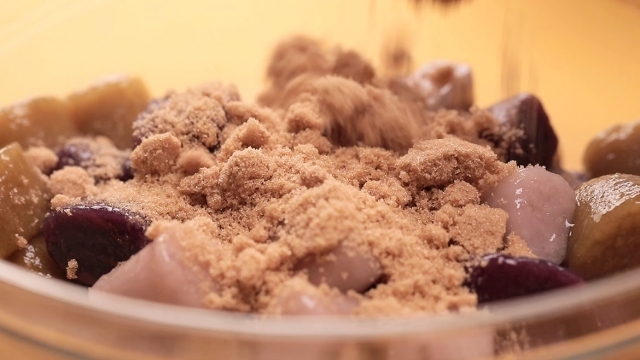 A colorful dessert that surprises you with the varying texture in a single bowl. Some would prefer eating them in a bowl of warm and sweet gingery soup, or you can have it with shaved ice. Try out this recipe and let us know what you think! 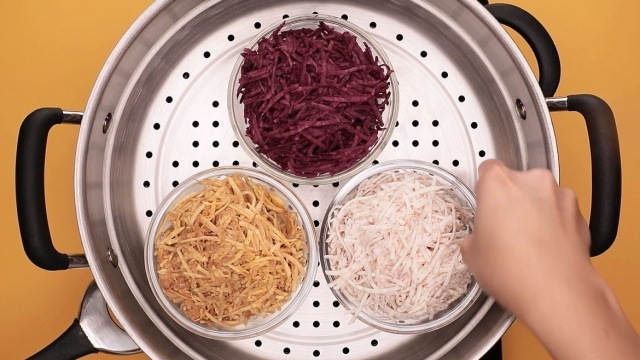 Deskin and cut them into long strips that fits the opening of the food processor. In the food processor, attach the shredding disc. Shred the yam and sweet potatoes separately. Place them on the steamer plate. Steam for 15 mins till soft. Transfer steamed yam into a mixing bowl. Mash while yam is still warm. Once the mixture has cooled down, use hand to knead it till no visible flour. Add in more flour gradually if the dough is still wet and sticky. If the dough cracks, it means that it’s too dry and you can add in 1 tbsp of water at a time to knead to the desired consistency. Dough should be moist and smooth. Repeat the same step for sweet potatoes. Once all the doughs are rested, take yam dough and place it on the table. Roll into a long strip and cut to desired size. Coat it with tapioca starch. Set aside. In saucepan, boil 1.5L water. Add in all the balls. Cover the lid for 2 – 3 mins till it floats on surface of water. Drain and transfer into a bowl, add in light brown sugar. #Tips: this will help to separate the balls and add a sweet note to the balls. In a food processor, attached the slicing disc. Add in ice cubes and slice it. Scoop into a serving bowl. Pour coconut milk over it. Top it up with grass jelly, red bean and balls.